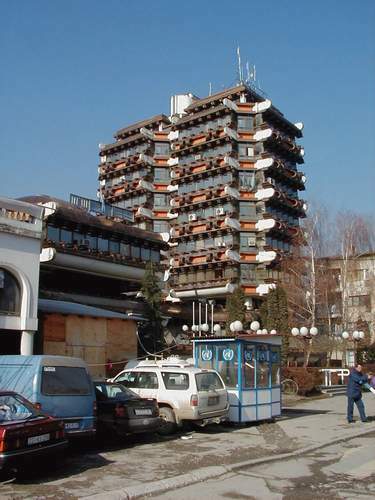 United Nations Headquarters, Peja, Kosovo. Peja (pronounced Pay-a) is located in Northwest Kosovo, near the border with Montenegro. Peja is the Albanian name for the city. The Serbian name is Pec (pronounced Pesh). 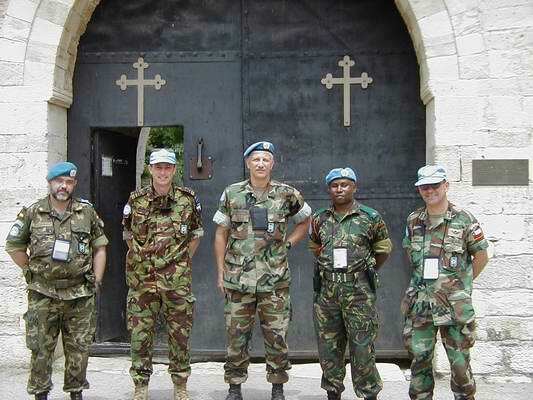 Andy and Military Liaison Team assigned to Peja. The photo was taken outside the Serbian Orthodox Patriarchy in Peja. They are Major Ernesto Cuervo (Spain), Commander Mike Salvador (New Zealand), Andy, Major Augustine Mwangupili (Malawi), and LtCol Manuel Matas (Chile).